You are probably looking at this recipe and wondering why anyone would want to cook something that is bitter. Well stay with me for a second and give this funny little veg a second chance. Bitter melon is used for various stomach and intestinal disorders including gastrointestinal (GI) upset, ulcers, colitis, constipation, and intestinal worms. It is also used for diabetes, kidney stones, fever, a skin condition called psoriasis, and liver disease; to start menstruation; and as supportive treatment for people with HIV/AIDS. 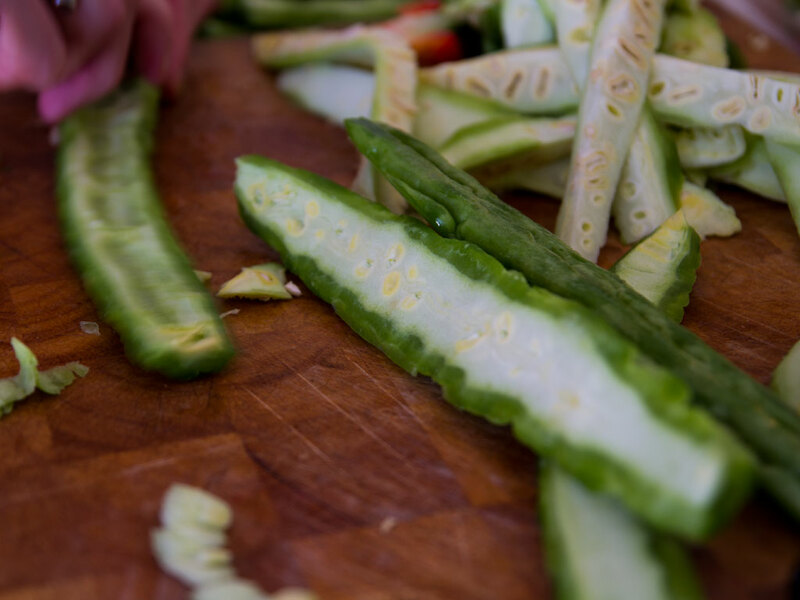 Bitter melon also contains a chemical that acts like insulin to help reduce blood sugar levels. Bitter melon is not a usual dish for many North American’s. It is used as a vegetable in India and other Asian countries in curry dishes. It is a little finicky to cook and if you don’t get it right the results can be icky. With that being said the bitter aspect of the vegetable can be quite nice if it is not over powering and paired with the right ingredients. Bitterness is the most sensitive of the tastes, and is perceived by many to be unpleasant, sharp, or disagreeable. Bitter is highly alkaline so if your recipe is too bitter balance it with sweet, salty or sour. 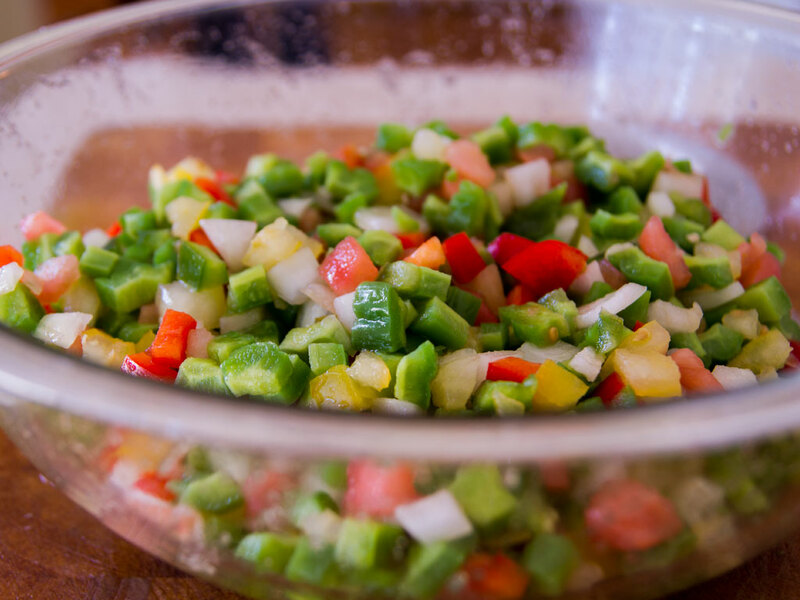 This relish was quite easy to make and has lovely hues of red and green. It makes a beautiful accompaniment to burgers, sausages and would make a lovely topping for a bake brie. The tastes will also mellow with time as they ferment in the vinegar so choose several small canning jars to store the relish. I also chose to use regular white refined sugar as the result is 6 cups of relish which turns out to only be a trace amount once used on your burger. If you wish to substitute it for stevia remember that stevia is 300 times more sweet than regular sugar so keep that in mind. I would not suggest using a liquid sweetener. Remember the finished product yields about 6 cups but one would only use about 1 tablespoon. Try this relish on our Black Bean and Quinoa burgers. Slice the bitter melon length ways and remove the white pith and seeds. Blanch in boiling hot water for 30 seconds. 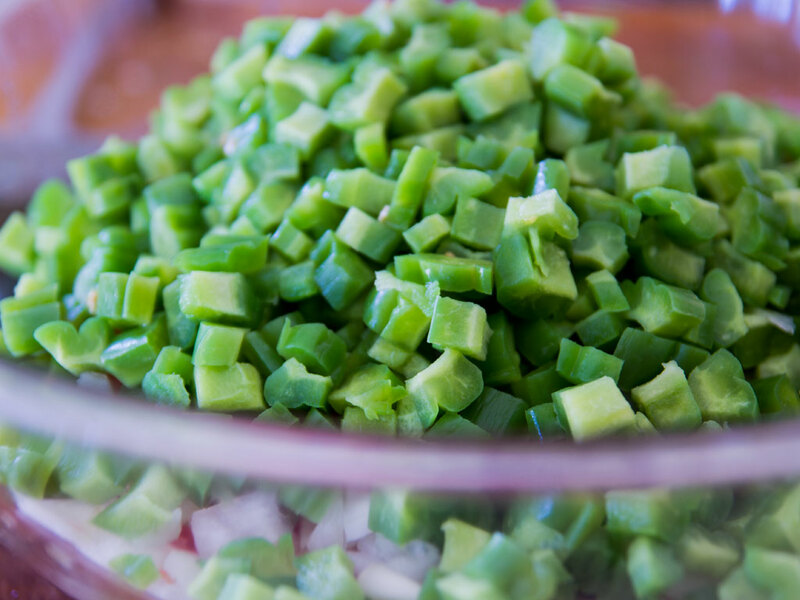 Remove from water and finely chop. To easily peel the tomato place in boiling water for 2 minutes. Skin should easily peel back. Then seed and chop finely. Seed and chop the rest of the vegetables and place in the large bowl with the red tomato and bitter melon and mix well. Mix the vegetables with the salt and let stand for an hour or overnight. Drain the vegetables and put in a large pot. Add 2/4 cups of the vinegar and the water, and bring slowly to a boil. Drain again. Mix the sugar, cinnamon, turmeric, cloves and allspice to a smooth paste with a little of the vinegar. Bring the remaining vinegar to a boil, stir in the paste, and add the white mustard seeds and the vegetables. Bring to a boil and cook for 20 minutes, stirring constantly. Turn into hot jars and seal. I make this with whatever veggies I have on hand. The last batch started from lacto-fermented. 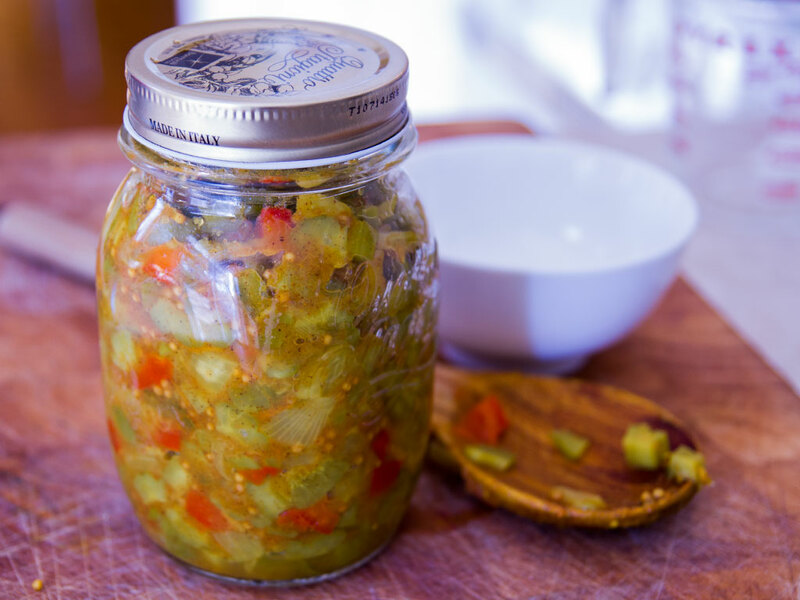 I had made so much I decided to make relish with some of it. I had used fresh turmeric, fresh lemongrass, and fresh Thai chiles in the original ferment. That worked great.flavor-wise. It was the perfect base for a relish. Btw, I kept the seeds and pith in the ferment. They actually have a mild flavor. Thanks for this! Bitter melon is such an under appreciated vegetable!